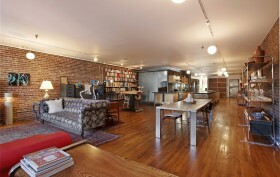 We’ll just come out and say it: this Clinton Hill loft is really cool. The 2,074-square-foot space, lined with big windows that face both north and south, takes up the entire third floor of the live-work cooperative at 93 Lexington Avenue. You’ll still find the original industrial details of the former warehouse building throughout the apartment, including an incredible copper-doored elevator. Another freight elevator, also an original detail of the building, opens directly into the apartment. It last sold in 2012 for $880,000 (slightly over the ask of $855,000) and now it’s on the market for much more, $1.575 million.